We’d love your help. Let us know what’s wrong with this preview of Tigrai purve by Otto Carius. Otto Carius sunaikino daugiau nei 150 priešo tankų. Knyga skirta 502-ojo sunkiųjų tankų bataliono 2-osios kuopos bendražygiams. To ask other readers questions about Tigrai purve, please sign up. This book was interesting to me as a former armor commander myself. I have read Colonel Hans von Luck's Panzer Commander: The Memoirs of Colonel Hans von Luck which tells the story of WW2 combat in the European theater from the command point of view and also Paul Carell's Scorched Earth: The Russian-German War, 1943-1944 which gives a detailed overall history of the Russian-German war. This book filled a gap by giving an account of small unit actions (from squad up to company level). Carius was This book was interesting to me as a former armor commander myself. I have read Colonel Hans von Luck's Panzer Commander: The Memoirs of Colonel Hans von Luck which tells the story of WW2 combat in the European theater from the command point of view and also Paul Carell's Scorched Earth: The Russian-German War, 1943-1944 which gives a detailed overall history of the Russian-German war. This book filled a gap by giving an account of small unit actions (from squad up to company level). Carius was in the heat of battle all the way, and he was a very competent small unit commander. In final analysis, this is a good book to read if you are interested in armored action during WW2, especially on the Eastern front. Otherwise, you can give it a skip. Като танкист и командващ офицер е бил изключителен! Заради ниското си тегло е отхвърлян два пъти от армията, за да бъде приет най на края в пехотата. От там става доброволец за постъпване в танковите войски и заминава на обучение. През 1943 година започва да воюва на Източния фронт срещу настъпващите руснаци. По голямата част от унищожените от неговия Тигър цели ( над 150 танка и оръдия) са постигнати там. През 1944 година е ранен тежко и така и не успява да се включи пълноценно след възстановяването си в отбраната на Германия. Интересно е мнението му за настъпващите американци - намира ги страхливи, нерешителни и дори слаби бойци ( може би не си е давал сметка, че те вече са спечелили войната и не са искали да дават излишни жертви, все пак за разлика от при комунистите, човешкият живот е ценен в демокрациите). За руснаците се изказва далеч по-ласкаво, но е на мнение, че и те печелят с цената на огромни загуби и заради превеса си в жива сила и техника. Надява се американците да се съюзят с немците и заедно да ги изтласкат в СССР назад - желание, което за съжаление не се сбъдва. Бързо е пуснат от американски плен - те не са имали никаква идея, кой е той. Свидетелства от първа ръка за издевателствата им над пленените немци - военни и цивилни. В книгата са описани няколко блестящо проведени танкови операции, както и доста провали, дължащи се основно на некомпетентни офицери и войници с малък боен опит. Предадена е и подробно срещата му с Химлер, по случай награждаването на Кариус с висок орден за храброст - Дъбови листа към получения по-рано Рицарски кръст. Zanimljiva tematika ali knjiga je nespretno napisana pa radnja često skače s jednog mjesta na drugo, ponekad je to naporno pratiti. Takva je priroda rata, konfuzna, posebno kada se povlačiš. I nije mi se svidjelo sprdanje autora s ratnim zločinima. U jednom trenutku uspoređuje ratne zločine s ubijanjem pjetla. Ubiti pjetla i 30 milijuna ljudi nije isto. Jedna zvjezdica manje zbog toga. One of the best tank aces ever, Otto Carius, describes his experience of WW2 from a "commander's hatch" viewpoint. Starting out as a loader in Pz 38 (t), he moved up to a commander rank of the famous Pz VI Tiger heavy tank. He destroyed a significant number of tanks, assault guns and even one plane (!) at the East Front. At the later stage of WW2 he participated in the defensive fights in Germany where he commanded a Jagdtiger company, but Germany's plans to win the war had already failed by the One of the best tank aces ever, Otto Carius, describes his experience of WW2 from a "commander's hatch" viewpoint. Starting out as a loader in Pz 38 (t), he moved up to a commander rank of the famous Pz VI Tiger heavy tank. He destroyed a significant number of tanks, assault guns and even one plane (!) at the East Front. At the later stage of WW2 he participated in the defensive fights in Germany where he commanded a Jagdtiger company, but Germany's plans to win the war had already failed by then. You can find great insights into the life of a common German tank crew - the struggles with incompetent commanders, lack of supplies, the occasional incredible (mis)fortune that shapes the outcome of the whole operation... You'll also find some opinions on the politics and state of warfare during that time which helps with humanising the average Wehrmacht soldier - some of them were simply doing their duty, which is something you can't escape if you want to live. Ideologies become void when bullets start flying. Not my usual fare, but I picked this up after getting hooked on the World of Tanks Blitz game. There are a lot of interesting tidbits about what life was like for tankers on the Eastern Front, but it's not what I hoping for. It stands in complete contrast to A Bloody War: 1939-1945, which I read years ago and still remember fondly. Some details are very vivid and memorable. Picture them falling asleep in the tank, and waking up with their hair frozen into the frost on the inside of the tank. Or hi Not my usual fare, but I picked this up after getting hooked on the World of Tanks Blitz game. Some details are very vivid and memorable. Picture them falling asleep in the tank, and waking up with their hair frozen into the frost on the inside of the tank. Or his friend that slipped on the ice in front of a moving tank. The meeting with Himmler and the generals discussing arming the Croats to fight the Serbs. The authour's opinion of Russian and American fighting abilities. Some are much more mundane. They spent more time towing broken tanks than you'd ever imagine. But there are several factors here that end up making it less than I hoped for. First up, I suspect the translation was done by someone less than ideal. It's very stilted and awkward in many places, and I can't help but think it reads better in the original. Secondly, the authour obviously had a couple of axes to grind here. He spends a lot of time defending the regular German soldier against what he feels is persecution by everyone outside the armed forces. I can only imagine the lot of a German soldier post war, and thus I understand a bit why he's doing it, but it doesn't read well. The authour also, quite honestly, comes across as a cold, arrogant know-it-all. Let me be clear here. If anybody has the claim to talk about WWII tank warfare with authority, this guy is it, period, end of discussion. His track record (pun intended) is almost without equal. On the other hand, he spends half the book talking about which commanders he liked, and which ones he ignored. I can't help but think his level of independence would never be tolerated in almost any other situation. He mentions often how he always spent time with the men rather than off apart from them, but he mentions only a handful by name. Apparently they all loved him, but it's hard to tell if it was reciprocated. Any officer mentioned gets much more press than the people I'm assuming he spent time with day in and out. The last tank loss he describes where he's commanding on foot and the tank is destroyed is so cold as to be inhuman. Many things, including pretty much every battle, are described very dryly, with no personal details. We moved here, took this position, destroyed that many tanks. It's impossible to tell in many places whether the authour was even present at any given place in the recital. He's commanding, so the royal 'we' makes sense I suppose, but it ends up so distant it's not lifelike. The spots where it becomes personal are the best parts of the book, and they are few and far between. There is a bunch of 'end matter' in this edition, over a third of the book is reproduced records of the time, often not written by the authour at all. It's also pretty dry, with a few exceptions. The section written by the mechanics is fascinating when you read between the lines - you can picture those poor guys attempting to fix these behemoths under fire in the middle of nowhere and running into problems they can't control. Представете си малкото немско градче Хершвайлер-Петерсхайм (само си го представете, не е нужно да го произнасяте). Влизате в аптека с нетипичното име „Тигър“. Посреща ви добродушен възрастен аптекар, всъщност най-възрастният аптекар в Германия. Поне до 2015 година. Името му е Ото Кариус и освен ако не сте запалени по военната история, вероятно няма и да разберете, че пред вас стои един от най-резултатните немски танкови асове от Втората световна война, записал на сметката си близо 200 унищожени Представете си малкото немско градче Хершвайлер-Петерсхайм (само си го представете, не е нужно да го произнасяте). Влизате в аптека с нетипичното име „Тигър“. Посреща ви добродушен възрастен аптекар, всъщност най-възрастният аптекар в Германия. Поне до 2015 година. Името му е Ото Кариус и освен ако не сте запалени по военната история, вероятно няма и да разберете, че пред вас стои един от най-резултатните немски танкови асове от Втората световна война, записал на сметката си близо 200 унищожени танка на противника! Уви, такава среща вече не е възможна. Възрастният ветеран умира в началото на 2015 година, но освен аптеката, именувана на легендарния танк, Ото Кариус оставя в наследство и своите мемоари. „Тигри в калта“ е неподправено свидетелство от първо лице за бойния път на 502-и батальон тежки танкове на североизточния фронт – между Нарва и Дюнабург, както и последните сражения на автора в заключителния етап на войната срещу американците на Запад. There are certain faults with the Carius memoir (I read the 2003 1st Edition Stackpole Series). It tends to be dry at times, says nothing about any possible war crimes committed by the German Front, and generally gives a rather selective view of the battlefield. But as a historical source? This memoir is highly valuable. Not many German panzer commanders wrote their memoirs. There is Hans von Luck and Friedrich von Mellenthin... but that's pretty much it, and both of them were rather higher ranki There are certain faults with the Carius memoir (I read the 2003 1st Edition Stackpole Series). It tends to be dry at times, says nothing about any possible war crimes committed by the German Front, and generally gives a rather selective view of the battlefield. But as a historical source? This memoir is highly valuable. Not many German panzer commanders wrote their memoirs. There is Hans von Luck and Friedrich von Mellenthin... but that's pretty much it, and both of them were rather higher ranking officers. Carius's memoir gives people insight into the fighting on the Eastern Front from the point of view of a lower ranking officer who wasn't socialized in the German officer core. Moreover, the omission and bias that Carius's memoir has, actually turns out to be pretty valuable in discerning the German reaction to defeat in 1945. The memoir is also a good read in and by of itself. Carius... or at least from what I can glean from the English translation, is rather charismatic and one can see why he rose through the ranks to command his company. He is strongly opinionated about the service of the German front soldier, but at the same time he's rather self-effacing, modest, and matter-of-fact about his role in the company. These aspects of his personality make the memoir vary from matter-of-fact deliveries on battles and specifications of the Tiger and Jagtiger, to sarcastic and witty comments about his superiors and the situation at hand, to respectful references to the service of his comrades, and then to strong ideologues about his opinions. This book is written by Otto Carius, one of the most decorated WWII German tank commanders. His keen observations, situational awareness, and tons of luck helped him to survive even the most dreaded Eastern Front. The book contains a lot of small unit actions in muddy conditions along the Baltic countries from a low ranking Wehrmacht Panzer officer's point of view. His stories are very detailed but remarkably dry, matter-of-fact, and most of the time emotionless. And he seemed to be quite unhapp This book is written by Otto Carius, one of the most decorated WWII German tank commanders. His keen observations, situational awareness, and tons of luck helped him to survive even the most dreaded Eastern Front. The book contains a lot of small unit actions in muddy conditions along the Baltic countries from a low ranking Wehrmacht Panzer officer's point of view. His stories are very detailed but remarkably dry, matter-of-fact, and most of the time emotionless. And he seemed to be quite unhappy about the way WWII veterans were treated by Americans and perceived by the German public after the war. Like many other Wehrmacht officers, he was under a delusion and even had very high "hopes for a joint struggle against the Russians" until the very last moment of the war. His private conversation with Himmler after Himmler personally presented him the Oak Leaves to the Knight's Cross was very interesting too. All in all, this personal accounts is worth reading and highly recommended. If one were to remove the identities of the nations at war and whether the troops were German, American, Russian, or other--in short, take out the political aspects--this account could be any warrior's story. It reads very much like the personal accounts of American and British soldiers. Politics and the rest are in the background. Instead, there is duty, defense of the nation and, at the very core, support for one's comrades in battle and fear of letting them down. In fact, the book itself was If one were to remove the identities of the nations at war and whether the troops were German, American, Russian, or other--in short, take out the political aspects--this account could be any warrior's story. It reads very much like the personal accounts of American and British soldiers. Politics and the rest are in the background. Instead, there is duty, defense of the nation and, at the very core, support for one's comrades in battle and fear of letting them down. In fact, the book itself was meant to support his comrades after the war. For me there were a number of interesting small details. I did not know that the turret on a Tiger tank was controlled by a pedal that rotated the turret in one direction when pressed forward and the opposite when pressed back and, either way, at varying speeds so the turret and cannon could be rotated quickly at first and then slowed to almost clock-like precision to stop on the target, requiring very little if any adjustment before firing. I didn't know the interiors were painted white. I had not appreciated how dangerously cold the interior of the tank became in bad weather. A number of small but interesting details emerge almost by accident from this account. The capabilities of the Tiger were interesting as well. The conventional, and probably correct, wisdom of the war is that the Soviet T-34 was the best tank on the field. Yet, time and again, this author and the tanks he directs fight and win in battles against superior numbers of T-34 tanks. I suspect that general tactics played a role. He notes that the Soviets drove fully buttoned up and with limited visibility whereas the German tank commander kept his head just enough out of the turret so he could quickly see in every direction. Seeing first means shooting first and he took out many Soviet tanks before they even realized they were in a battle. Carius is also a very smart and careful man and that helped him when staging for a battle. He personally met Himmler when he was awarded a very high decoration and the description of the meeting is surprising. He was surprised as well. First, when he went to meet Himmler [after the attempted assassination of Hitler] his credentials were barely examined and he was allowed a private interview with Himmler while wearing his service pistol. Himmler, himself, was gracious, willing to listen, sophisticated and gentlemanly. This is not to say that Himmler was not a monster [Carius doesn't say] because he was. But apparently even monsters can present themselves as highly civilized and considerate. There must be a warning there. Carius is harsh in his remarks about American soldiers whom he confronted near the end of the war. He did not think them very good soldiers. But, he met them when Germany was collapsing and they were practically strolling into occupation of the country at a time when nobody wanted to be the last person killed in the war. He somehow forgot that he was facing these poor soldiers in Germany rather than in America and that they got there somehow. Hitler and his very capable Wehmacht wanted to cross the Channel and invade Britain [Operation Sea Lion], but never could quite put it together or get their feet wet. The poor American soldiers and their British and Canadian allies did cross the Channel and pushed the Germans all the way into their own country and to absolute defeat. Perhaps they were not as poor as he wanted to believe. Part of his opinion of the Americans was formed because he thought German prisoners were treated harshly. Yeah, so what? They were finally released alive. Few Americans were feeling charitable to Germans after they liberated the Dachau concentration camp. Carius' complaints on this score do not move me. I favor the attitude of 'Bomber' Harris who commanded the British bomber service. An old black and white clip shows him sitting behind his desk and saying in a rather high voice something like, "The Germans came into this war thinking they were going to bomb everyone else and nobody was going to bomb them . . . ." Bomber Harris, and the American Eighth Air Force showed them how mistaken they were. Good for them. By comparison with the American treatment of prisoners, there were about 300,000 German soldiers in Stalingrad and the old movies of them being marched across vast plains of snow and ice after their surrender is disturbing since of all of them only about 6,000 returned. It scarcely needs mentioning that the Germans were often brutal to their prisoners, particularly those captured on the Eastern Front. Carius was very luck to be captured by Americans. I liked this book, particularly reading of Otto’s experiences on the Eastern Front. It’s incredible to read about the day-to -day heroics of front line soldiers. I was however bothered by his criticism of the Allied Powers- particularly the Americans- near the end of the book. He spoke of the cruel treatment he and fellow German soldiers suffered at the hands of his captors while not once acknowledging or speaking to the atrocities millions suffered under the heel of the Nazi jack boot. He spoke I liked this book, particularly reading of Otto’s experiences on the Eastern Front. It’s incredible to read about the day-to -day heroics of front line soldiers. I was however bothered by his criticism of the Allied Powers- particularly the Americans- near the end of the book. He spoke of the cruel treatment he and fellow German soldiers suffered at the hands of his captors while not once acknowledging or speaking to the atrocities millions suffered under the heel of the Nazi jack boot. He spoke of going several days without water while in a POW camp but mentioned nothing of gas chambers, execution squads or ovens. I greatly respect and admire Otto’s courage, loyalty, and devotion which he showed his men and country. Any casual reader of WWII history- especially of the Eastern Front would have read of the shear terror and brutality of the war. His experiences are nothing short of incredible but the final chapters of his book left a bad taste in my mouth. dont usually read books like this but it was worth it. This definitely a military mans book alright. Its all about reports, battle tactics, day by day fights, etc. Otto is someone who clearly takes great comfort from being in the army. Even as its clear things are all going to hell, the way he tells it, its as if just another day. As long as the army structure is upheld he just gets on with it. He is bitter with the portal of the soldiers after the war and that he has to hid his accomplishments a dont usually read books like this but it was worth it. He is bitter with the portal of the soldiers after the war and that he has to hid his accomplishments and in denial of the crimes committed during the way. decent first hand account of tank and infantry fighting in the Eastern Front, Group North in 1943-44. In the main body of the book, Carius seems to skip over many details which would have made this more interesting for me, but later I found some of what I was looking for in his After Action Reviews lumped together at the end. Overall a good read, not very complicated, a good WW2 diary. Впечатли ме особено отношението на командирите - винаги на купола, рискувайки живота си за да спасят екипажа. Не мога да си представя наш командир на тази позиция. Несправедливо ми се струва по филмите тази особеност да се представя подигравателно като някакво високомерно перчене пред противника. "I found out that even with the best intentions there are limits to physical stamina...I was ordered to bed and was allowed neither tobacco nor alcohol. The fact that I also didn't have any desire for them told me how really bad off I was." Memuaarina annab teos täitsa midagi: saab teada kus, kuidas, mis ja kellega juhtus. Aga peale selle jääb ikkagi igavaks, pole kirge, emotsioone, ei ilusid ega valusid. Ja need on ju ometi need, mida otsime raamatuist. 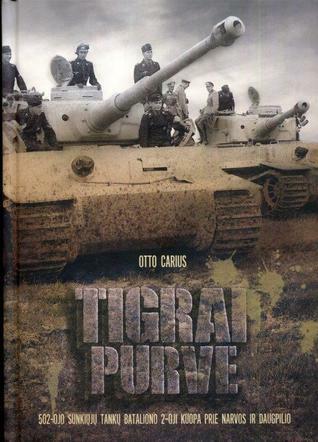 Interesting book about everyday life of tank crew of Pzkpfw IV “Tiger”. But there are a lot of mistakes made by publisher. People with basic/moderate knowledge of armour of second world war would notice this immediatle. Plus illegal use of photos is minus. Well worth reading if you like tanks, to read how a real tiger crew worked. Worth reading just to see the German view point. Good detail on both the Eastern and the end of the war in western Germany. It is a personal account and I found Me Carius's viewpoints interesting and informative. The author's shrill defence of the honour and innocence of german soldiers during WWII makes this work hard to endure. If you're interested in armored warfare on the eastern front, read it. If not, give it a pass. When "World War II" is uttered, Americans and Russians are brought to mind as the heroes. Yet, the Germans were also heroes -- they fought for what they believed in, and well. Otto Carius was one of those German heroes, a tank ace who fought for his country despite overwhelming odds. Een zeer interessante autobiografie. Een opbouwend verhaal dat volgepakt zit met actie en spanning. Dat is straf aangezien het een autobiografie is, een echt gebeurd verhaal dus en niet fictie. Het geeft een Duits spectrum weer van de oorlog, aangezien het komt van een lage Duitse officier. Hij verteld over de oorlog op een andere manier. één die begint als een agressie oorlog maar uiteindelijk veranderd in een strijd om te blijven leven. Otto Carius verteld ook zeer expliciet en in detail over Een zeer interessante autobiografie. Een opbouwend verhaal dat volgepakt zit met actie en spanning. Dat is straf aangezien het een autobiografie is, een echt gebeurd verhaal dus en niet fictie. Het geeft een Duits spectrum weer van de oorlog, aangezien het komt van een lage Duitse officier. Hij verteld over de oorlog op een andere manier. één die begint als een agressie oorlog maar uiteindelijk veranderd in een strijd om te blijven leven. Otto Carius verteld ook zeer expliciet en in detail over zijn gevechten in de Tijger tank. Alsof dat de momenten waren waar hij voor leefden. Niet enkel zijn militaire carrière op het slagveld wordt besproken. Maar ook het statuut en aanzien dat hij door de jaren heen heeft verworven. Zo ontpopt hij zichzelf tot één van de meest geliefde Duitse tank commandanten uit de oorlog. Het Duitse volk zag hem als een popster. Dit ontsnapte ook Hitler niet en maakte van Carius en dergelijken gebruik als propaganda materiaal. Carius vermeld dit ook aangezien hij Hitler vaak heeft ontmoet voor medaille uitreikingen en propaganda stunten. Ook dit maakt Otto Carius interessant aangezien maar weinigen van zijn rang of lager ooit de eer hebben gehad om van Hitler persoonlijk medailles te krijgen. Net zoals in de oorlog wordt het boek na verloop steeds grimmiger, Duitsland is op de terugtocht. Veel goede mannen sterven voor niets. Het wordt voor Carius een strijd om te overleven. Zijn imago weegt zwaar op hem door, hij draagt veel verantwoordelijkheden met mee. Overal waar hij moest vechten zagen andere soldaten hem als een onverslaanbare held. Dit gaf hen vaak valse moed. Otto Carius was tenslotte ook maar een man. Zijn leven na de oorlog wordt ook in detail weergegeven. Dit is een mooie afsluiter van zijn biografie. Hij verteld over de zware tijden vlak na de oorlog. Zeer fijn boek om te lezen, al bevat het tamelijk veel vakjargon. Er komen veel militaire en duitse termen in voor. Voertuigen worden met hun bijnaam aangesproken, plaatsnamen worden genoemd die nu niet meer bestaan bv: Königsberg, de hoofdstad van het voormalige Pruisen, wordt nu Kaliningrad genoemd. Zeker een aanrader voor iedereen die Wereldoorlog 2 een interessante periode vindt. Tigers in the mud is a very clean (as in little guts and bloodspill) memoir of Otto Carius' combat career. Most of the action takes place on the relentless Eastern Front. His approach is very personal, as he talks about what he sees, does and feels. A huge emphasis is put on the camaraderie on the front and how no one who's been through that can't really understand the "brotherhood" feeling, which does make sense. Still, somehow, it's all a bit clinical and felt somehow detached on some level, s Tigers in the mud is a very clean (as in little guts and bloodspill) memoir of Otto Carius' combat career. Most of the action takes place on the relentless Eastern Front. His approach is very personal, as he talks about what he sees, does and feels. A huge emphasis is put on the camaraderie on the front and how no one who's been through that can't really understand the "brotherhood" feeling, which does make sense. Still, somehow, it's all a bit clinical and felt somehow detached on some level, somehow filtered. For some reason the latter half of the Kinderheim part just got very boring, then the thing got back up to speed. Interestingly enough the insane tiredness didn't somehow come through from the text. Based on the descriptions they slept little and worked insanely, but I guess that after a bunch of years the insanity had faded into a haze. Carius' meeting with Reichsführer SS was just about as curious as Rudel's chats with Hitler. These show a very different view from the public image of these people, in this case Carius himself comments on that how strange it was to have such a casual chat with one of the most feared men in the Reich. His views of the end-war Americans just casually strolling around Germany in the Ruhr pocket was amusing. Then again, compared to the brutal Eastern Front anything would've seemed like a kindergarten, I guess. He was also very clearly offended by the hate shown towards the Germans by the Allies (that lasted for decades), as people easily labeled all Germans as nazis instead of separating fanatics from duty and honour -bound folks. These memoirs fulfill the tome about German efficiency. I suspect something was lost in a translation that reads like it was from Google Translate. Nevertheless, the point by point, emotionless recounting of troop movements and equipment was not what I was expecting when reading this. I desired something with more emotion, something that spoke to the effect of experiences, the tool of war, shared anecdotes both from fighting and being with comrades - most of what was missing here. On top of that These memoirs fulfill the tome about German efficiency. I suspect something was lost in a translation that reads like it was from Google Translate. Nevertheless, the point by point, emotionless recounting of troop movements and equipment was not what I was expecting when reading this. Tigers in the Mud is a great companion for someone who is not interested in the image of enormity of war. There are no painful or extremely detailed explanations of young men suffering which actually was the case during the war. Instead Commander Otto Carius explains strategies of tank combat during his service years 1940-1945 in the 21st Panzer Regiment and how he pulled off such fearless fights on the battlefields in the Eastern front. In total he took down incredible 150+ tanks plus as many a Tigers in the Mud is a great companion for someone who is not interested in the image of enormity of war. There are no painful or extremely detailed explanations of young men suffering which actually was the case during the war. Instead Commander Otto Carius explains strategies of tank combat during his service years 1940-1945 in the 21st Panzer Regiment and how he pulled off such fearless fights on the battlefields in the Eastern front. In total he took down incredible 150+ tanks plus as many antitank guns.